The tracks on the CD(R) below (MP3 downloadable) illustrate the kind of Christian music that was available before the 60s 'beat boom', and before groups like the crossBeaTs started. 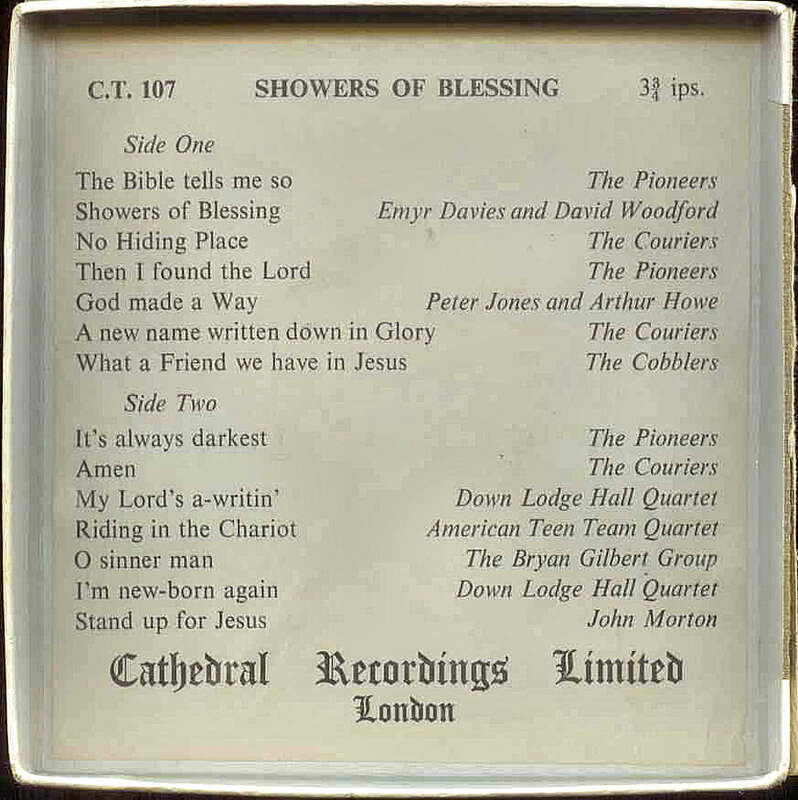 It has to be said that recordings such as this were rare, but this is perhaps typical of the 'style' of Christian music that was felt to be 'cutting edge' for youngsters. It is from a small 'ree-to-reel' tape that was for sale to the public by "Cathedral Recordings", catalogue number CT 107. 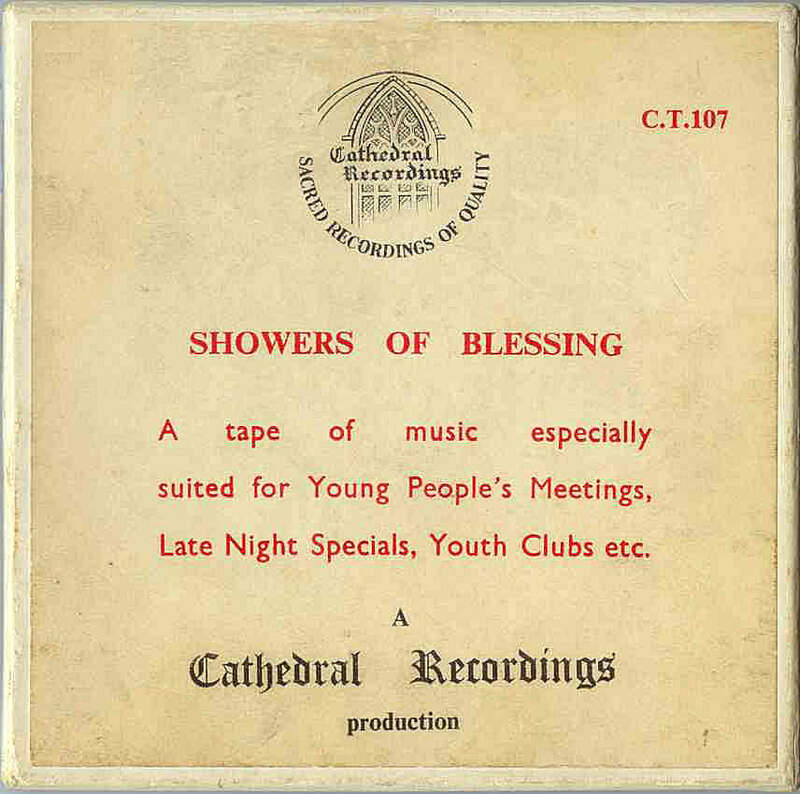 The cover of the tape box describes it as being 'especially suited to Young People's Meetings, Late Night Specials, Youth Clubs etc.' See below for more details. Left click this button when it appears, to play the song on your chosen player. If you want to save the file, right-click the button, and choose "Save Target As ...." or "Save Link As....", depending on your browser. 1 The Bible tells me so The Pioneers There may well have been 60s groups also called "The Pioneers", but we never came across them - see list of 'other groups'. 2 Showers of Blessing Emyr Davies & David Woodford Emyr Davies (this one?) apparentlly had a 7" single in 1965 on 'Evangelical Recordings'. 3 No hiding Place The Couriers There may well have been 60s groups in the UK also called "The Couriers", but we never came across them - see list of 'other groups. In the 70s, an American group called The Couriers (same one?) had 2 LPs out - 1975 "Kinda Country" and 1977 "Comfort, Strength and Happiness".'. 4 Then I found the Lord The Pioneers There may well have been 60s groups also called "The Pioneers", but we never came across them - see list of 'other groups'. 5 God made a way Peter Jones and Arthur Howe These two guys were from Spellow Lane Church, Liverpool (Four Square?). Peter Jones later lectured at Westminster Seminary in Escondido, CA, and currently heads up TruthXchange. 6 A new name written down in Glory The Couriers There may well have been 60s groups in the UK also called "The Couriers", but we never came across them - see list of 'other groups. In the 70s, an American group called The Couriers (same one?) had 2 LPs out - 1975 "Kinda Country" and 1977 "Comfort, Strength and Happiness".'. 8 It's always darkest The Pioneers There may well have been 60s groups also called "The Pioneers", but we never came across them - see list of 'other groups'. 9 Amen The Couriers There may well have been 60s groups in the UK also called "The Couriers", but we never came across them - see list of 'other groups. In the 70s, an American group called The Couriers (same one?) had 2 LPs out - 1975 "Kinda Country" and 1977 "Comfort, Strength and Happiness".'. 10 My Lord's a-writin' Down Lodge Hall Quartet Is this the Down Lodge Hall (Wandsworth, London) connected with D L Moody? (see below for an additional recording by this group) This seems like a "Youth for Christ" venture(?) Teen Teams were groups of teenagers sent from the YFC organization in one nation to the YFC organization in another nation, to witness through song and spoken word. For example, there was apparently an LP entitled "Teen to Teen Around the World" on Word Records around 1964(?) It was mostly well-known hymns. 12 O sinner man The Bryan Gilbert Group The Bryan Gilbert Group, The Headstone Quartet later had a 12" LP on the Pilgrim label (JLP113) entitled "Travelling with the Lord". 13 I'm new-born again Down Lodge Hall Quartet I wonder if this is the Down Lodge Hall (Wandsworth, London) connected with D L Moody? In 2011, I had an e-mail from David Woodford who was actually the founder of 'Cathedral Recordings'. He told me that the company was started around 1961-62, and that CT107 was the first of a basic type of recording that was issued between 1962-65, later to be replaced by a more commercial format. He said that 'Cathedral' was the very first company to issue Christian music on tapes - although it wasn't long before they issued records as well. The company issued recordings of 'The Four Kingsmen' from Somerset (an EP) as well as a group called 'The Peacemakers'. The latter, led by Justin Rees, the son of evangelist Tom Rees, recorded a complete LP for Cathedral in a London studio. David informed me that Justin Rees currently (2011) lives in Canada and works as an evangelist. Further details regarding some of these artists were also given to me in an e-mail from Mervyn Crawford in 2011. I have reproduced the bulk of his e-mail below, with some parts edited (italics). Mervyn also sent me a recording of a disc he bought at Bury St Edmunds YFC in the early 1960s. It is by The Youth For Christ Teen Team (probably the same as the Cathedral group above), and is entitled "Yes He Did". You can download/play it here. I became involved with Youth For Christ in Bury St. Edmunds in 1962, just before they held a two-week crusade in October of that year, led by American evangelist Bill Bathman and supported by the Pioneers who were an Anglo-American group. My future wife, Sheila was converted at that crusade and continued to correspond with Bill and the Pioneers for some time. The Pioneers' music was quite varied, based on a close-harmony male-voice trio, but included trumpet solos and duets (John Morton on your website), mixed-voice trios, duets and solos etc. The group members were Brian Bounds (tenor & soloist) Gwynne Bounds (contralto and pianist) John Morton (baritone & trumpet) and Frank Carroll (baritone & trumpet). They produced an EP ('Meet the Pioneers') quickly followed in early '63 by an LP ('On the Firing Line'). Later that year another LP followed ('On Tour with the Pioneers'). The quality of the recording seemed to improve with each release.